Something’s Fishy in the Garden! The story of the Native Americans planting a fish with each ear of corn may be legend, but fish fertilizer is nothing new. Fish and fish parts have been composted and used as fertilizer since ancient times, providing much-needed nutrients and minerals to soil, soil microbes, and plants. Modern commercial fish fertilizers make this practice easy for any gardener. Made from byproducts of the fish-oil industry, fish fertilizer is a potent (albeit smelly) organic amendment to your lawn or garden. It’s used primarily as a source of nitrogen and trace minerals, and the granular meals also make a great soil conditioner. Early Spring Feeding: The nutrients in fish fertilizer are released faster than other organic fertilizers, giving an early boost to lawns and gardens. Leafy Vegetables: Green leafy veggies such as lettuce benefit from the extra nitrogen in fish fertilizer. 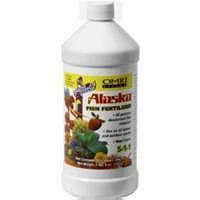 Applying it to foliage provides a quick boost to leafy plants and grasses. New Plants: Use fish fertilizer to encourage seedlings and new plantings. Fish Meal: Made from ground-up dried fish byproducts, fish meal supplies nutrients, minerals, and organic matter that condition soil. It’s rich in nutrients but breaks down more gradually than other fish fertilizers, making it a great slow-release soil amendment during planting. Hydrolyzed fish: Hydrolyzed fish is made by partially-digesting whole fish and fish waste with enzymes. The end product is a sort of compost tea that provides easily-absorbed, potent nutrients, plus amino acids and oils that aren’t present in fish emulsion. Fish Emulsion: This is the least potent but most economical form of fish fertilizer, made from the liquid that’s left over after the fish are processed. This liquid fertilizer is used for foliar feeding or soil drenching and provides readily-available nitrogen and small amounts of phosphorus and potassium. Liquid fish fertilizers usually come as a concentrate that you dilute with water and apply with a sprayer, or pour it onto the soil. I am interested in making liqiuid fertiliser using dried fish prawns crabspowder and silcon powder and seaweed piwder for pomigranates grapes cardamum banana and Rose cultivation for more flowering fruiting and yield. Thank you for the interesting information on the web page. Hope to hear from you soon regarding my request.